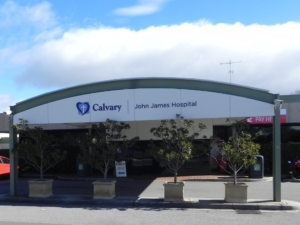 Calvary John James Private Hospital strives to provide the highest standard of health care to their patients through evidence based practice and access to the latest medical technology. The birthing suites at Calvary John James Hospital offer a relaxing, safe and comfortable environment in which to have your baby. The hospital encourages the active involvement of partners or a support person throughout your pregnancy, birth and beyond. After the birth of your baby, skin to skin contact between mother and baby begins immediately. Similarly, if you are scheduled to have a caesarean birth, skin to skin is commenced in theatre unless there are medical issues with the mother and/or baby. Following a caesarean birth, mother, partner and baby remain together in recovery. Once you have been transferred back to the postnatal ward, your baby will remain with you in your room and partners or support persons are welcome to stay overnight. Your midwife will provide support and assistance with caring for and feeding your baby.